Garmin, probably best known for GPS systems, is gaining attention with two new offerings in the action camera market. The “VIRB” and “VIRB Elite” offer sought-after options and a few new twists that make them unique in the current market. Both cameras offer recording in many different modes: [email protected], [email protected], [email protected]/60fps and [email protected] The Elite model also includes 30fps and 60fps in the 960p and 720p modes. Both can do still photos at 16MP, 12MP and 8MP. Audio is built into both cameras, with an optional 3.5mm jack for external audio. This all seems pretty standard. So what makes the Elite earn the name “Elite”? Unlike the standard VIRB, the Elite has GPS, accelerometer, altimeter, and streaming Wi-Fi through 802.11bgn frequencies. Both of these cameras are water resistant straight out of the box, though a dive housing is available if you’d like to get your scuba trip on camera. Utilizing a removable 2000mAh lithium ion battery, the Garmin VIRB cameras boast up to a three-hour battery life. Those are some of technical aspects. 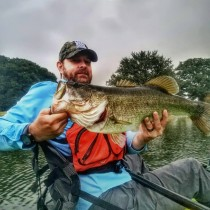 How about some real world talk you can’t find on the specs page?I have a kayak fishing friend who uses the VIRBs down on the Texas coast. We were visiting at a boat show last month and he gave me a hands-on demonstration. Each has a 1.4” display screen on the back that is both a menu screen and a playback screen. The menu was simple to use and navigate, but the instant playback really sold the show. The other thing that stood out was the flat mount used to hold the cameras. While very strong, the quick-connect flat mount provides for easy attachment and detachment of the camera. This allows your mount to stay stationary, but for you to view playback without changing angles on the mount. Pinch the clips, and the camera is in your hand. Find out if you need to move left or right, place the camera back on the mount and make the slight adjustment. No more guessing at angles. Both cameras come with an assortment of cables and mounts to get you started, and additional mounts are available. The VIRB is listed at $299, while the VIRB Elite is $399. I see a lot of benefits to the options offered in the VIRB lineup, and that is what is needed for the booming market of action cameras. Everyone wants a piece of the pie. The question is, what makes you different? The VIRB is definitely worth a look from the specs sheet. On-the-water tests will be the best way to make a recommendation. The video I have seen thus far has been high quality. Until I can test the camera my personal “jury” is still out, but this may be the camera to bridge the gap to the next level of performance. A camera rich in features with long battery life is a bit of a unicorn at this point. If the three hours holds up, this could be the next big thing.